It has all the ingredients of a classic Dan Brown novel: a scholar from the Vatican’s secret archives, centuries of mystery and intrigue, and a faint inscription on an ancient Christian shroud. Yesterday, in a Times online story, Barbara Frale, a staff historian at the Vatican archives, announced that she had deciphered the imprint of Greek, Hebrew and Latin writing on the famous Shroud of Turin. According to Frale, the lettering is part of a death certificate glued to the shroud covering Jesus Christ immediately after the crucifixion. Frale, who is about to publish a new book on the shroud, says that such certificates were often issued in the old Roman colony of Palestine, particularly in criminal cases. The body of an executed criminal could only be returned to the grieving family after the individual was buried for a year in a common grave. Christians, of course, believe that Joseph of Arimathea took possession of Christ’s body shortly after death, carrying it to a tomb he had prepared for himself. But Frale says that a death certificate could still have been attached to his shroud. Frale has clearly studied the inscription, and she presents new evidence. But I find the archaeological evidence far more compelling. In 1988, the Catholic Church gave the University of Arizona and two other institutions the task of dating the Shroud of Turin. These institutions ran Accelerator Mass Spectrometry tests with meticulous care on snippets from the shroud, revealing that the fabric was much younger than previously believed. The tests showed that it dated between A.D. 1250 and 1390. Critics of the dating tests charge that the researchers mistakenly took snippets from medieval repairs to the shroud. But new fiber studies conducted on the University of Arizona sample reveal that its overall weave structure is identical to that of the rest of the textile. We certainly haven’t heard the end of the controversy over the famous shroud yet. But right now, I think the odds are stacked strongly in favor of a medieval origin. It’s very sad to see that old erroneous news still trump new correct news in the media. The 1988 radiocarbon dating tests were done on what were actually strips of unrepresentative samples of the Shroud taken from the same area. This was a damaged area that was repaired by extremely skilled medieval nuns with a technique known as “invisible weaving” whereby they replaced the damaged or missing linen with bleached cotton in such a way that it was totally imperceptible to the naked eye. The 1988 carbon dating has thus been proven to be erroneous and is now referred to as the “carbon 14 fiasco”. Unfortunately, the media is not interested in this new news. So I respectfully suggest you look at the scientific articles posted on Dr. Giulio Fanti’s website at the University of Padua — as well as the articles posted on the website of the University of Ohio — for an update. There is now a mountain of scientific evidence showing that the Shroud is genuine (if one knows where to look) and Dr. Barbara Frale has made a significant contribution to this question. Since those visiting your website have a right to expect that you have done your research before expressing an opinion, here’s your chance to stop misinformation from being circulated ad infinitum on the Worldwide Web. Could you please provide links to the articles examining the question of “invisible weaving?” I’d like to read them. The photo on the page shows one of the polarized light microscopy images. I sent you a long list of articles on the question of the “invisible weaving” of the Shroud, but it seems to have been “discarded” (it may have been too long). If you don’t receive it, please let me know. See the abstract of a paper titled “Analytical Results On Thread Samples Taken From The Raes Sampling Area (Corner) Of The Shroud Cloth”, by Robert Villarreal with Barrie Schwortz and M. Sue Benford, Saturday, August 16, 2008, Ohio State University, Blackwell Hotel, posted at http://ohioshroudconference.com/a17.htm. I note that this time you received the list of articles, but that the hyperlinks mysteriously disappeared after I clicked on “submit comment”. This problem might be resolved by copy/pasting the names of the authors and the title of each article and doing a Google search. Otherwise, please communicate with me by email and I’ll send you a copy of my original list with the hyperlinks. Thanks for this, Michael. I’ve just returned from a trip to California, and am now swamped. But I will take a look at these articles when I get a chance. You’re very welcome, Heather. If you need anything else, please let me know. I sincerely believe that after you’ve read these articles, including the one by Ray Rogers, your perceptions regarding the Shroud will change. In effect, Rogers was one of the original STURP scientists who still had a sample of the Shroud in his laboratory. He thought it would be easy for him to disprove the “invisible weaving” theory advanced by Benford and Marino. But to his great surprise, his new analysis of the sample showed they were probably right. To his credit, he wrote an article in a prestigious journal to report his new findings. Dang Michael, you bamboozled man! My Professor was speaking about this the other day…quite interesting, the facts you laid out Michael, are indeed correct. Thanks for the positive feedback. If you’re interested, you might wish to read some of the amazing scientific articles posted on the website of Dr. Giulio Fanti, associate professor of mechanical engineering at the University of Padua. For starters, I strongly recommend you read “BODY IMAGE FORMATION HYPOTHESES BASED ON CORONA DISCHARGE”. If you decide to read it, please let me know what you think of the only plausible scientific theory to date as to how the image was formed on the Shroud. One thing is for sure: it will amaze you. Where did the shroud come from and how does one know that is truly is the “shroud” of Christ? What, besides the bloody head area makes one assume that Christ has anything to do with the Shroud of Turin? The answer to your question requires at least a book. If you read Italian, I suggest Dr. Giulio Fanti’s 604-page “encyclopedia of the Shroud” entitled “La Sindone: una sfida alla scienza moderna” (The Shroud: A Challenge to Modern Science). SHROUD OF TURIN: QUESTIONS FOR SCEPTICS. A) How did the forger obtain a large piece of linen from the time of our Lord (as will certainly be shown when the new carbon dating is done) from the holy Land ? B) How and why did he produce a NEGATIVE IMAGE, when some skilled artists today state that they cannot make a negative image of a face? C) How did he know that crucifixion victims were nailed through their wrists, not their hands, as shown on medieval paintings and crucifixes? D) How did he know that the blood that he used had to be Group AB to match that on the Sudarium of Oviedo (that could have been the cloth wrapped round the head of the victim whilst being removed from the cross and having the nails removed)? E) How did he know that the Roman flagellum had three cords with dumbbell shaped metal pieces at their ends? F) How did he know that two men did the scourging? G) How did he manage to let the bloodstains penetrate the cloth while the image on the cloth is only on the superficial fibres and shows no pigment? H) How did he know that the crown of thorns was a cap rather than a circlet as shown medieval images of our Lord? I trust this will pique your curiosity and motivate you to become an amateur Sindonologist. Unlike some previous “documentaries” on the subject, this one promises to be more objective, so it’s probably well worth seeing. 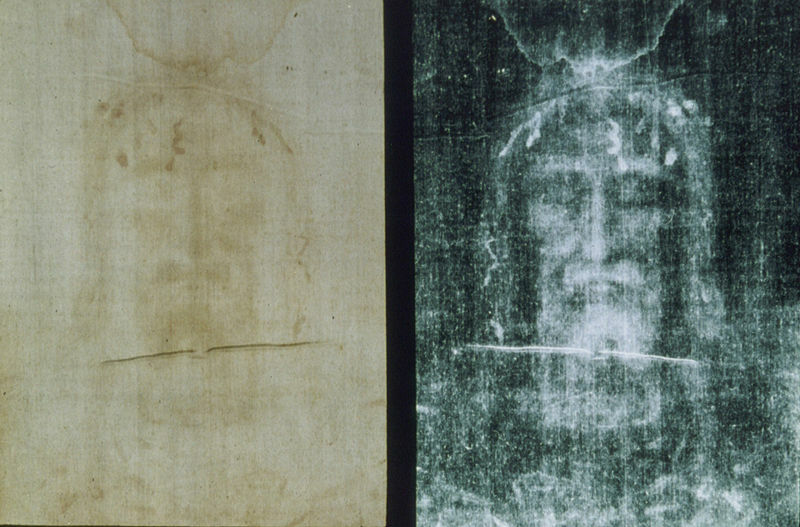 One of the features of the Shroud that makes it absolutely unique and that links it to Jesus is that it has breathtaking three-dimensional characteristics never before seen in any other image known to man. This feature was first discovered by NASA with special imaging equipment. This natural inbuilt 3-D feature of the image makes it absolutely impossible for any medieval con artist to have created it because it could not be visualized by any viewer — including the purported forger himself — prior to the invention of the said special imaging equipment in the 20th century. It’s thus interesting to know that the History Channel documentary focuses on this 3-D feature of the Shroud to attempt to recreate or reconstruct Jesus’ face. I initiated the above chain of comments in response to Heather’s excellent article regarding Dr. Barbara Frale’s new book, which is essentially about the Greek, Hebrew, and Latin lettering that has been found on the Shroud of Turin (a misnomer) by scientists and scholars. See http://www.shroud.in/ for the facial image with some of the surrounding lettering. If one looks under the chin of the Shroud Man (as Sindonologists often refer to him), one can clearly see the letters “esou” – (I)esou(s) – and the letters “Nnazarennos” – Nazarene – on the right side. With all due respect for the contrary opinion, these letters are neither a coincidence nor the figment of Dr. Frale’s imagination. This lettering and the accompanying text clearly identify the Shroud Man’s cadaver for burial purposes under Jewish and Roman law, expressly mention the date as “the year 16 of the reign of Tiberius” – i.e. the year 30 AD – and state, inter alia, that the man in question was condemned to death because he was found guilty of something. Many people find it very difficult to come to grips with even the possibility that this lettering constitutes proof that Jesus actually died (i.e. a death certificate), and that the scientifically inexplicable image on the Shroud constitutes proof of Jesus’ resurrection. Let’s be frank. The real problem posed by the Shroud in our increasingly secularized society is this: If it is actually genuine, then we have to drastically change the way we live our lives. And living life according to Jesus’ standards is very hard to do, even for people who call themselves Christians. Bless you, bro, for your work. I just wanted to add, after viewing the above referenced special it brought to mind something I’d forgotten. Back in the mid 1970’s I worked in the retail industry in Beverly Hills, CA. We sold Men’s Furnishings. Because much of our stock was high level and imported we would try to repair damaged stock instead of returning it to the vendor. There was an elderly gentlemen from Europe with a nearby shop who knew how to “re-weave” fabric that had become damaged or frayed. We used this man exclusively because it was considered something of a lost art. It came as no surprise to me when I viewed the special that this had been done to the Revered Icon. It is not difficult to envision artisan/nuns undertaking this task as a mission from above. But the point is that “re-weaving” is not a figment of some zealot’s imagination, it was an actual practice not common to modern times. I just thought you might find that interesting. Pax et tibi! Thank you very much for your kind words and the confirming ‘modern’ textile evidence. Fortunately, some ancient trades and crafts survive to this very day. Friends, Mr. Iacono is correct on all counts. I might add that the photographed image reveals a knowledge of anatomy and physiology not known to science until well into the 19th century. A noteworthy example is the fact that the Shroud image does not show THUMBS. When a nail pierces the wrist (through the “Spot of Destot”), it damages the radial and medial nerves, causing the thumb to retract in toward the base of the 5th phalanx (“pinky” finger). This effect is NEVER shown in medieval art and was only demonstrated in the 19th century. *See Habermas and Stevenson, “Verdict on the Shroud”, (1981) p. 35., published right after the Shroud of Turin Research Project (STURP) was completed. I hope this information helps to allay any doubts that any of you might have concerning the authenticity of this most amazing relic. Many thanks to Messrs John Donahue and Bert Moraga for their kind confirming remarks regarding certain scientific aspects of the Shroud. It’s comforting to know that there are many others who are interested in Sindonology, a scientific field which, in my view, will eventually allow the Shroud to recover from the carbon-14 fiasco of 1988. More importantly, I’m convinced that it will give some skeptics the opportunity to seriously consider revising their view that Jesus of Nazareth was just one of many solar myths. In the latter video, one can also see Prof. Giulio Fanti presenting irrefutable scientific evidence regarding the double image on the Shroud. Belated thanks, Mr. Donahue, for your kind comments and for providing readers with much additional scientific evidence supporting the Shroud’s authenticity. As for the Spot of Destot, you’re absolutely right. In April 2008, I met a Sindonologist from France who informed me that, when a pathologist first noticed the Shroud Man’s thumbs were turned inward, he immediately understood why … and was literally moved to tears. As for the Roman coins, they clearly contain minting errors similar to those previously found by archaeologists on other coins of that period. Since archaeology is Heather’s area of predilection, she may perhaps wish to examine this question further and let us know what she thinks. Clearly, no medieval hoaxer could possibly have been brilliant enough to know these neurological and numismatic facts, in addition to all the other information scientists have gleaned from the Shroud. Sorry for the delay in responding. And thank you very much for your kind words and the additional scientific evidence you have provided in support of the authenticity of the Shroud. There is now so much evidence in at least twenty different scientific and other academic disciplines that it would be impossible to mention it all here. All this evidence strongly suggests that modern science is not incompatible with faith, especially not with the basic tenets of Christianity. Topic 1: Dr. Ray Rogers’ change of opinion (2005) with regard to the Shroud samples in his possession and the “invisible reweaving” of a patch on the Shroud. Dr Rogers states: “I think I can come very close to proving that it [the Shroud of Turin] was used to bury the historic Jesus.” This is a very powerful statement from one of the original members of the STURP team who initially believed the 1988 carbon-dating tests proved the Shroud was a fake. The image on the Shroud also shows that the Shroud Man’s legs are not broken. If one needs more scientific evidence than the above to even consider the possibility that the Shroud of Turin might be authentic, I will gladly provide it next time. The way Jesus was denied three times? And the rooster crowed? this is but another attempt to discredit the identity of the son of God. What is the truth?